In the back of my mind I have always been conscious that high street deodorants contain undesirable ingredients such as aluminium chlorohydrate, parabens, propylene glycol, triclosan, TEA, DEA. All of these ingredients are a concern but the one that sticks out for me is aluminium. This is a sweat blocking ingredients used in antiperspirants. In recent years concerns have been raised about whether it can be absorbed into the body and contribute to the development of breast cancer. Now I am not here to scaremonger I just want to share my thoughts and let people make informed choices. It would be poor judgement on my part not to include an article I discovered at info.cancerresearchuk.org. Cancer Research UK states “There is no convincing evidence that antiperspirants and deodorants cause breast cancer.” Yes I admit I am confused, who's advice should I be listening to? What is clear to me is I have always experienced problems with regular deodorants. They can cause me skin irritations or make my nose twitch leaving me feeling like I have a cold. I tend to stick to the same brand for many years usually only needing to switch when they re-formulate because guaranteed it will no longer be suitable. Over the years I have become aware of aluminium free deodorants but I admit I have had a negative attitude towards them because they can be expensive and reviewers complain about having smelly arm pits. I decided that since I was blogging about natural products it was time to take the plunge and make a purchase. I started off looking on the high street rather than online. I was surprised to discover a couple of aluminium free deodorants at Boots - PitROK & Bionsen. 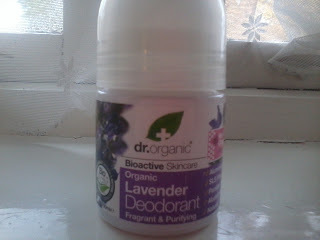 I am a regular shopper at Holland & Barratt and took a look at the Dr Organic deodorant range. Dr Organic deodorant is free from aluminium, SLS, parabens and alcohol. You can choose from Aloe Vera, Pomegranate, Tea Tree, Vitamin E, Lavender and Manuka Honey. I love Lavender so it was an easy decision for me. Dr Organic deodorant is a roll on. Personally, I am just not a fan of that sticky, wet armpit feeling and having to flap your arms waiting for it to dry. This was certainly a hurdle I had to overcome. So what do I think? I think the key to natural deodorant is to expect to re-apply throughout the day. I have a desk job so rarely breakout in a sweat. I started to notice a slight hint of my own body odour at home time which is not bad considering I have a nine hour work day. I admit I am not a gym bunny so can not comment on how effective it would be during exercise. My guess is I would have to re-apply before and after. I did not break out in skin irritation which is a bonus nor did I get a stuffy nose as the fragrance is natural. The soggy armpit feeling isn't a winner for me. A natural deodorant does not prevent you from sweating so you experience natural wetness. I’ve come to realise that you need to view these deodorants from a different angle we are programmed to believe sweating and natural odour is a bad thing. You have to take a big leap of faith to purchase a natural deodorant. From what I read online these types of deodorants may take trial and error because our skins are different. It may be necessary to try several in order to find the correct combination of natural ingredients for your armpit. Dr Organic deodorant does not come cheap at £5.19 for 50ml. In comparison PitROK costs £3.05 - £5.59 for a spray or stick. Bionsen costs £2.35 - £3.29 and comes in roll on, stick and spray. I have to admit I still use my regular antiperspirant but alternate with Dr Organic when I know I won't be doing an activity that will break me out in a sweat. Whether or not to use a natural deodorant is clearly a personal choice. I would be interested in hearing your opinions on the topic. If you already use a natural deodorant which one are you using? Great natural find as always :) I wonder if it will be effective for heavy sweaty work out etc. As far as I know, Lush have a natural deodourant that has Soda Bicarb (instead of aluminium) to neutralise smell. Not tried it though. I certainly have some more research to do so thanks for the heads up about Lush.